In Unity you’ll want to change the transforms of your objectinstances quite often. The transform of an object determines its position, rotation and scale (size) in the world. If you want to do anything beyond changing textures on a static scene, there is no way around manipulating the transform. Now, this is hardly a problem when translating (changing the position), or scaling (changing an object’s size). When rotating however, this becomes a problem when you manipulate eulerangles, the easiest way to understand rotations. You’ll have to deal with Gimbal Lock. 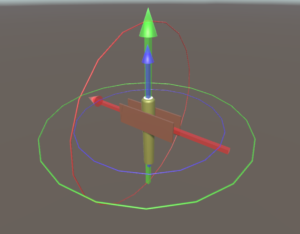 (a phenomenon that makes small, incremental changes to rotations makes them go haywire when over a certain point) To prevent this, Unity internally represents rotations as Quaternions. But what are Quaternions? In this selftuition, I will try to clear both my own confusion about Rotations as well as any confusion readers might have. I will focus only on 3D. I hope I have supplied you with enough information to understand rotations, as well as some practical examples you can copy into your own projects. As mentioned in the Introduction, I was really struggling with rotations, not knowing how to properly use them. While writing this article I gained a lot of knowledge on how you use rotations and I hope I have succeeded in passing some of that knowledge on. If you feel like you need some more information or maybe hear it in a different way, please check out the sources linked below.